Anthony J. Curcio (born September 1, 1980) is an American former criminal turned author and speaker. In 2008, Curcio was responsible for one of the most elaborately planned armored car heists in US history. He was eventually arrested and sentenced to six years in federal prison. Upon his release from prison he has devoted his life to working with youth in the field of drug abuse and crime prevention, speaking to students and athletes across the U.S. He has been featured in GQ, Esquire, 20/20, Fox News, NPR and NBC among others. 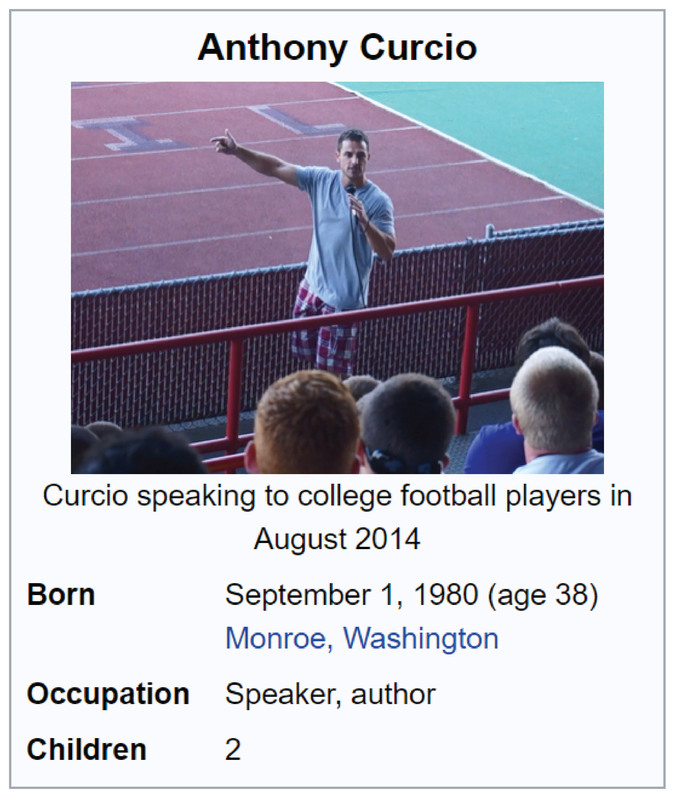 Curcio was born and raised in Monroe, Washington. As a teenager, he was popular and talented and voted captain of both football and basketball teams at Monroe High School. Curcio broke many records in football and received several honors and awards for his play in both sports. Curcio would later go on to play football at his father’s alma mater, the University of Idaho which had been his childhood dream. While returning a punt in practice, Curcio tore his anterior cruciate ligament, ending his promising college football career and introducing him to the powerful pain killer Vicodin. Curcio quickly became addicted to the prescription pills. Soon after, he began experiencing withdrawals and even injured himself intentionally by kicking an oak coffee table repeatedly in order to obtain more pills. With family pressure Curcio agreed to enter a drug/alcohol treatment facility. After completing a 21-day in-patient program, Curcio now sober, started his first business called “Tony’s Gaming”, which bought and sold casino tables and other gaming merchandise. Curcio expanded his business by leasing a commercial space and adjacent storage. Within few months of being open to the public, Tony’s Gaming was unexpectedly shut down. The Washington State Gambling commission and local police raided Tony’s Gaming and confiscated the inventory, stating Curcio did not possess the proper permits. Under increasing financial pressure Curcio relapsed and began forging prescriptions on his computer. He later became aware that the police raid was due to influence from a real estate broker who had financial interest in a local casino. Curcio attempted to retain legal representation in the case but was denied services by local attorneys already debriefed by the real estate investor/casino owner. Curcio and several of his associates retaliated against the casino owner by breaking into his businesses and removing computers, files and documents from the offices he owned. Curcio continued to maintain an outward appearance that resembled a successful business owner and family man. He graduated from college, married his high school sweetheart, had two daughters and would later own a real estate investment company based in Seattle, Washington. However, he was living two different lives. As his addiction progressed so did his involvement in illegal activities. By his mid 20s, Curcio had already organized several high-dollar thefts, scams, and loan-sharking schemes, and was also behind a sports memorabilia counterfeiting ring. ABC News stated that Curcio was spending nearly $15,000 a month on his increasing drug habit that now also included cocaine and benzodiazepines. Although he had completed four drug and alcohol treatment programs, relapse was never far away. Curcio’s real estate investment business took a heavy downturn when the economy collapsed in 2008, leaving him with several homes on the verge of foreclosure and vehicles near repossession among other outstanding personal debts. With assets and bank accounts depleting Curcio hatched the idea to rob a Brink’s armored car. For three months Curcio observed a Brink’s armored car make its deliveries to the Bank of America branch in Monroe, Washington, and he took notes of the schedule and diagrammed locations of the bank’s cameras and the armored car’s blind spots. He also estimated how much money was being transferred to the bank and how much was being removed via ATMs. When he considered police protocol in responding to robberies, the location of the bank and their containment of roads he realized he needed a good getaway plan. That’s when he decided on using the local river to escape.After weeks of hand-dredging the river (Woods Creek) and a failed practice attempt using a jet ski for the getaway, he changed his approach and created a cable pulley system to quickly pull himself, and large bags of cash, upstream in the river using a connected canvas-wrapped inner tube. Curcio’s planning culminated with an advertisement he placed on Craigslist a few days before the robbery. The online ad sought 15 to 20 workers for a fictitious city cleanup project, promising $28.50 an hour. The laborers were told to wear jeans, a blue shirt, work shoes and a yellow safety vest. The ad also told the applicants they needed to bring safety goggles and a painter’s mask. The ad directed them to meet in the Bank of America parking lot at the exact time Curcio planned to rob the armored car. On September 30, 2008, Curcio, dressed identically to his decoy applicants, pretended to work the grounds near the bank. Wearing a blue shirt, jeans, yellow safety vest, work boots and painter’s mask, he pepper-sprayed the Brink’s armored-car guard who was pushing a dolly loaded with money into the bank. The pepper spray forced the guard to reach for his eyes and release the cart that held the money. Curcio grabbed two bags of money, containing more than $400,000, and ran toward the creek. Meanwhile, police arrived to find the bank’s parking lot filled with men matching the robber’s description. At the water’s edge, Curcio threw the money into the inner tube, and he pulled himself down the creek with the cables he had previously strung. He travelled about 200 yards downstream and exited the creek behind several businesses on the opposite side of the highway as the bank. Curcio removed his wig and construction outfit that had been attached by Velcro revealing different attire underneath. He hopped in a getaway vehicle and left. Curcio’s careful planning and unusual getaway gained national attention. The timing of the robbery came days after announcements of the government’s bank bailout package that included Bank of America. The unique robbery techniques gained notoriety for the mysterious robber who was referred to as the “Craigslist Robber” and “D.B. Tuber”, after the 1970s hijacker D. B. Cooper. Curcio’s undoing would come a month later when a destitute man reported to police that several weeks before the robbery he had seen a man drive up to the Bank of America parking lot and retrieve a disguise from behind a trash bin. The homeless man found it suspicious enough to write down the license number of the car that he would later provide to police. The car was registered to Curcio. After Curcio returned from a trip to Las Vegas, Nevada, the FBI began surveillance on him as a suspect in the robbery. Local authorities then retrieved a drink bottle that Curcio disposed of at a gas station with a sample of DNA and compared it to the DNA from the face mask and wig discarded a short distance from the scene of the robbery. The DNA from the bottle matched the DNA from the items left at the scene, and Curcio was later arrested in Lake Stevens, Washington getting out of a luxury SUV with $17,000 in cash. With only circumstantial evidence connecting Curcio to the crime he initially bonded out but a month later (January 2009), his bond was revoked and he was returned to custody after being suspected of witness tampering. Later details would reveal that $220,000 was recovered after an associate of Curcio’s came forward to make a deal with the FBI and local police. Curcio refused to cooperate with authorities and no other charges were ever filed against any of Curcio’s unnamed co-conspirators. All of the money except what Curcio paid to the getaway driver and other accomplices was eventually recovered. Curcio was sentenced to 72 months in federal prison and served his time in FCI Big Spring, FCI La Tuna and Coleman Correctional Complex. While being housed in FCI La Tuna, Curcio became close with fellow inmate George Jung. Jung encouraged Curcio to write a book, and put him in touch with author/biographer Dane Batty and the two began correspondence. During this time Curcio was with two inmates who had previously assaulted another inmate. While prison authorities knew Curcio was not involved in the attack, authorities still held him ‘under investigation’ until the case had been resolved. Curcio spent seven months in solitary confinement for this affiliation. In solitary he received beatings, witnessed suicides and would have cockroaches crawl all over his body at night. Upon his release, he wrote the book Heist and High, promising to help others from making the decisions he had. Throughout the duration of his sentence Curcio wrote and illustrated over 30 children’s books including one aimed at the children of incarcerated parents titled My Daddy’s in Jail. Curcio finished his incarceration at USP Coleman in Florida where he completed a drug-treatment program and was released from custody in April 2013. Curcio was released April 4, 2013 and returned to the Seattle area, reuniting with his wife and two daughters. He has since been working with youth and giving presentations regarding drug abuse prevention and the importance of making positive choices. He speaks to middle schools, high schools and universities across the U.S.
Curcio has been featured on several media platforms using his story to increase awareness regarding addiction. His book Heist and High (Nish Publishing, 286 pages) was released June 21, 2013 and has been the recipient of several awards.